The rehabilitation of Manila Bay is long overdue. Reynaldo Velasco, administrator of the Metropolitan Waterworks and Sewerage System (MWSS), said he believes cleaning the natural harbor, which is famous worldwide for its beautiful sunset, is a shared responsibility involving not only the government, but all concerned sectors of society as well. Velasco made the statement in the wake of the forthcoming Senate inquiry into the waste water treatment and sewerage system in Metro Manila, to be led by Senator Cynthia Villar. In an interview with the Philippine News Agency (PNA) on Friday, Velasco, a retired military and police general, cited the need for teamwork and adherence to the concept of shared responsibility to restore Manila Bay to Class B seawater fit for swimming, bathing and skin diving, in accordance with the guidelines issued by the Department of Environment and Natural Resources (DENR) under Administrative Order No. 34. 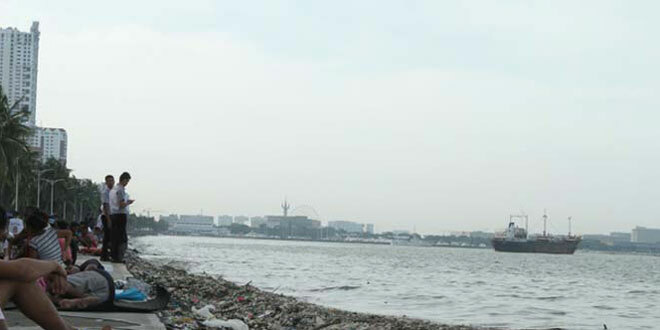 Manila Bay is polluted due to unabated garbage disposal by various sectors for decades. “For the Manila Bay waters to be rehabilitated, restored and maintained to a level fit for swimming, skin diving and other contact forms of recreation, teamwork from all sectors is necessary,” Velasco said. “The concept of shared responsibility must be put into practice that will include responsible citizenship in disposing of garbage,” he added. Poor and inefficient solid waste management, as well as inadequate proper wastewater facilities contribute to the worsening state of Manila Bay’s waters. While MWSS and its concessionaires, Manila Waters and Maynilad, are constantly working to improve their services, they face major challenges in implementing their programs. These include the availability of lots for wastewater treatment plants; bureaucratic red tape in getting permits; right-of-way problems that at times include the presence of illegal settlers; limited construction on streets; and unavailability of an updated drainage master plan. Velasco also said that the work to rehabilitate Manila Bay needs more than the construction of wastewater facilities and the collective efforts of the government agencies named in the Supreme Court Writ. Cooperation and collaboration from every citizen is needed to solve operational challenges, such as excessive debris and garbage, theft, and de-clogging problems, he said. Velasco noted that the Supreme Court issued a Writ of Continuing Mandamus on Dec. 18, 2008 directing 13 government agencies to clean up, rehabilitate and preserve Manila Bay in their different capacities. He said since MWSS was one of the agencies tagged, he directed to provide, install, operate, and maintain the necessary adequate waste water treatment facilities in Metro Manila, Rizal, and Cavite. Among the other agencies are the DENR, Metro Manila Development Authority (MMDA), the departments of education, health, agriculture, public works, budget, and interior and local government, Philippine Coast Guard, and Philippine National Police Maritime Group. Under the court order, the MWSS shall submit to the Supreme Court the list of areas in Metro Manila, Rizal and Cavite that do not have the necessary wastewater treatment facilities. Velasco said concessionaires of the MWSS were also asked to submit their plans and projects for the construction of wastewater treatment facilities and their completion period, which shall not go beyond 2037, the end of the concession agreements. Manila Water and Maynilad have their respective wastewater treatment facilities and sanitation programs. Manila Water has 40 such facilities with a total capacity of 310,267 cubic meters daily while Maynilad has 20 with a total capacity of 541,417 cubic meters daily. Seven additional wastewater facilities for Maynilad are under construction and one for Manila Water.